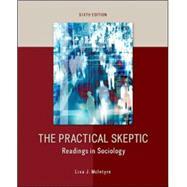 The Practical Skeptic: Readings in Sociology includes classic sociological research writings as well as recent pieces on fascinating topics of interest to students. It is the ideal companion to McIntyre's text, The Practical Skeptic: Core Concepts in Sociology, or other sociology texts. Readings in this edition challenge students to re-evaluate familiar social arenas: the college classroom, televised sports shows, restaurants, doctors' offices and even public restrooms. The readings focus around the essential message that there is much that goes on in the social world that escapes the sociologically untrained eye. * indicates reading new to this edition. *11. Beth A. Quinn, The Power and Meaning of "Girl Watching"